I’m starting to plan my return to Copenhagen Business School for the summer and came upon little gem. It was written by CBS Professors Sven Junghaven and Fleming Poulfelt, Per V. Jenster from the China Europe International Business School in Shanghai and Michael Jessen Holm, a marketing professional. Strategy Execution provides a unique and focused perspective on how strategy is conceptualized, and more importantly, implemented. I have seen many strategic plans on the bookshelves of senior executives – few are executed. Why? Some interesting answers are provided by the authors. Their focus is on small and medium size enterprise – a little examined segment of the market. Although centred in Denmark, this book would be useful for any SME organization or consultants who specialize in the area. Getting a different perspective from the standard North American festish with short-term profitability may give a competitive advantage in your strategic planning cycle. A worthwhile read. Clayton Christensen is well known as the author of The Innovator’s Dilemma. In this new offering, he has drawn upon his business experience as a consultant and professor to explain how high achievers can often fall into traps that lead to unhappiness. But how to measure happiness? satisfaction? achievement? How to avoid compromising your integrity in our current economic maelstrom? 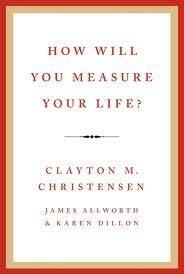 Christensen provides both wisdom and inspiration for anyone searching for a path to fulfillment. A great summer read! The heart and soul of strategy is action – the purpose of planning. Have a ‘wicked’ problem? One that is not so easily solved? Struggling to find your core ideology? Wondering how to make action out of ideas? Come on in and visit.